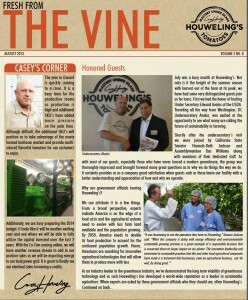 August brings another busy month at Houweling’s as “The Vine” highlights our tours with Undersecretary Edward Alvalos , California Senator Hannah-Beth Jackson and Assemblymember Das Williams. As an industry leader in the greenhouse industry, we’ve demonstrated the long term viability of greenhouse technology and as such we’ve developed a world-wide reputation as a leader in sustainable agriculture. Hence, we’ve had many government officials request to tour Houweling’s as they look for ways to improve food insecurity and safety in the nation. By sharing what we do with others on tours such as these, we greatly increase awareness and understanding of our operation and better position Houweling’s Tomatoes as a model for the future. Also, take a look to learn how we prevent pests from entering our greenhouses, about the additional SKU’s that will be reaching the stores and how quality is maintained at our facilities. 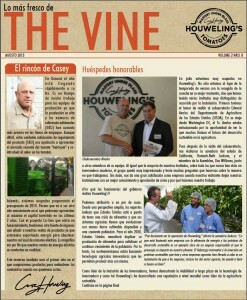 Click the image below to read the August 2013 Vine en Espanol. 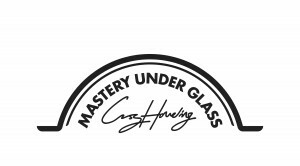 This entry was posted in Business, Greenhouse Grown, Health, Innovation, Newsletter, Recipe, Sustainability, Tomatoes and tagged Agriculture, Greenhouses, Houweling's, Houweling's Tomatoes, Hydroponics, Sustainable Agriculture. Bookmark the permalink. Comments are closed, but you can leave a trackback: Trackback URL.